Initial investigations suggest there could be a major gas reserve in the north-west of the country – but the possible use of fracking to extract the gas is highly controversial. THE OIREACHTAS COMMITTEE on Transport is to visit North Leitrim to talk to people in the area about their opinions on fracking. The 21-member cross-party committee is investigating the possible environmental implications of allowing fracking to be used in Ireland. Fine Gael TD Tom Hayes said the committee wants to talk to people who live in the area where fracking could potentially take place to gauge the level of opposition or support. Initial investigations in the north-west of the country have suggested that there could be a major gas reserve in north-west Ireland. However the use of fracking to extract the gas remains controversial. A number of countries, including France and Bulgaria, have already moved to ban fracking or introduce tight restrictions around it. “The debate is particularly charged in the northwest of the country, where areas of Leitrim and Fermanagh are being assessed for their suitability for fracking,” said Hayes. “We heard that any development might significantly impact on farming and tourism in the northwest, and pose a risk to groundwater supplies”. Minister for Communications, Energy and Natural Resources Pat Rabbittee has said that the government will not award any licences for fracking until the Environmental Protection Agency finishes its research, which was commissioned following concerns raised by residents in the northwest and southwest of the country. Initial investigations in the north-west of the country have suggested that there could be a major gas reserve in north-west Ireland. The company which has a licence for the area has said that the gas could be a major boost for the economy, bringing hundreds of jobs and a supply of gas for years to come. 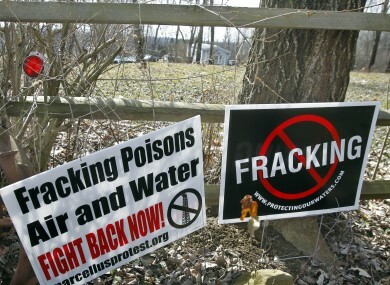 However local politicians, environmentalists and residents have urged caution over the controversial technique and a number of county councils in the area have already moved to ban fracking in their areas. Fracking is a technique of extracting gas from pockets in underground work by pumping water and chemicals underground at high pressures to break the rocks and release the natural gas. Email “Oireachtas committee to visit Leitrim to discuss fracking”. Feedback on “Oireachtas committee to visit Leitrim to discuss fracking”.